FOR the first time, the number of staff employed in UK call centres has topped 1m, a rise of nearly eight per cent in a year. And the number of UK call centres has grown to 5,180, from 5,040, an increase of just under three per cent. He forecasts a net gain of more than 200,000 jobs by 2011; 20,000 each would be in the North-West, Yorkshire, South-East and Scotland. The number of agent positions – one agent position equals an average of 1.62 jobs -- increased by just over 38,000 to 638,250, a rise of just over six per cent on the previous year. Mr Morrell said that 3.5 per cent of the UK working population are now employed in call centres – an annual salary bill of more than £15.5 billion -- with overall spending of about £20.8 billion per year. National picture Large call centres (250-plus agent positions) comprise eight per cent (about 377 sites) of the total, yet they employ 52pc of the UK’s total call centre staff. Call centres with 100 or fewer agent positions comprise 76pc of the total number of operations; and 26pc have fewer than 25 agents. Companies in retail and distribution operate most call centres, although the finance sector has the most agent positions. Outsourcing and telemarketing, services, travel and transport, telecoms and utilities are also important sectors. The mean average size of a UK call centre is 120-plus agent positions. The sectors with a larger than average call centres are outsourcers, utilities, motoring, telecoms, entertainment and leisure and finance. Regional picture (see map) The North-West has the highest percentage of call centre staff, at more than five per cent of the working population. London, at two per cent, has the least. 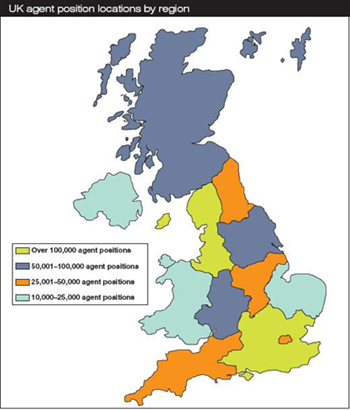 The South-East has the greatest number of agent positions; the North-East has the highest average call centre size and London the smallest. Inbound and outbound calling Last year, inbound calls totalled 49 billion minutes. Finance companies handled 18 per cent of the total; and large call centres (250-plus agent positions) took 57 per cent of these calls. Outbound calling – mostly used by outsourcers and recruitment companies -- dropped by about two per cent, to just fewer than 29 per cent of all calls, although the decline has now slowed. Cold calling, says Mr Morrell’s report, has dropped sharply due to the impact of the Data Protection Act and the Telephone Preference Service. However, there has been a big increase in cold calling from abroad, especially in finance and telecoms. On the other hand, there has been a considerable growth in warm-calling, which means calling existing customers to build relationships, carry out satisfaction surveys and to cross- and up-sell. Future ContactBabel forecasts that there will be a net gain of 200,000 call centre jobs by 2011, with significant growth in the retail & distribution and outsourcing & telemarketing vertical markets. Between 1995 and 2011, the industry will have grown by 116 per cent in terms of call centres and by 421 per cent in agent positions. "As an outbound channel...email is hard to beat"
Customer expectations Mr Morrell’s report says: “Although customers still complain about bad service through contact centres, the measurable standard of service has improved almost every year, with improvements in queuing time and call resolution rates occurring most years. Most complaints supposedly about contact centres are actually about the business itself, or the underlying systems or business processes which will not allow the agent to do what the customer requires. The impact of self-service “Self-service is of much greater importance than offshoring to the UK’s contact centres over the longer term. The reason for self-service’s guaranteed success is two-fold, in that it generally aligns both with what customers want (rapid and accurate interactions) and with what businesses want (a low cost of doing business). Multimedia and the role of text chat “Despite widespread analyst predictions that email volumes would account for over 25pc of interactions by now, the industry-wide figures is closer to five per cent. Polarised customer service “It’s likely that the interactions with the customer of the future will be a highly-polarised mixture of the automated and the personalised. “Moving a large proportion of interactions onto self-service will work for businesses, and having an automated third-party seek out the best deals on offer will appeal to many customers. This leads to the conclusion that many customer-agent interactions will be exceptions, such as a complaint, an urgent or complex issue or a technical query that an FAQ or customer community couldn’t solve. It is also likely that whole segments of the customer base who don’t want automation will be handled directly by live agents. ContactBabel’s latest report, UK Contact Centres in 2008: The State of the Industry is the sixth in the series of annual reports looking at the structure of the industry from an analytical and statistical viewpoint. It is based on the numerical analysis of a database of more than 3,400 UK contact centres, called the UK Contact Centre Operations Directory. The report details the size, structure and future of the contact centre industry, both in quantitative and qualitative terms, with a detailed commentary on how the industry will change to 2011 and beyond. 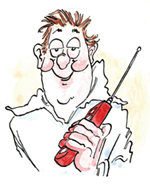 UK Contact Centres: The State of the Industry (sixth edition) costs £950 (plus VAT). Readers of Call Centre Europe are offered a £200 discount (please mention when ordering).